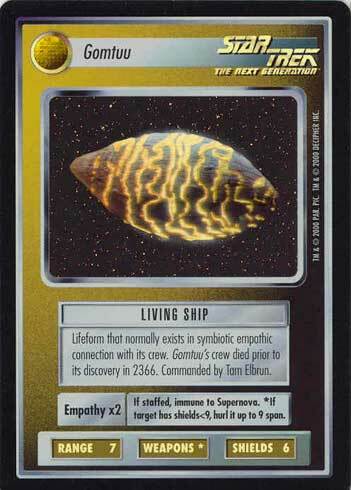 Lifeform that normally exists in symbiotic empathic connection with its crew. Gomtuu's crew died prior to its discovery in 2366. Commanded by Tam Elbrun. Empathy x2 If staffed, immune to Supernova. *If target has SHIELDS<9, hurl it up to 9 span. Image Source: The Next Generation: "Tin Man"